I modified this recipe from one that I found online to suit my family’s tastes. 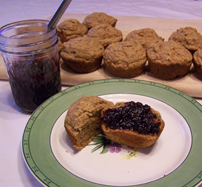 You can add nuts, raisins, or fruit to this if you like, but these muffins are very moist without anything added. They are delicious with homemade jams on top or plain. The food processor makes fast work of the cereal or put cereal in a zip top bag and crush with rolling pin. ingredients in medium bowl. Stir in remaining ingredients just until moistened. Bake until golden brown, 18 to 22 minutes. 12 muffins. Heat oven to 400 degrees. Grease bottom of muffin pan or use papers. Mix dry ingredients in medium bowl. Stir in remaining ingredients just until just moistened. (do not over mix). Bake until golden brown, 18 to 22 minutes. Yields 12 muffins.